Let the record show that I, Christina Dessertfortwo (legal name-change pending), am a huge fan of cookies that are baked and then rolled in sugar. Cookies: full of sugar, check. Cookies rolled in sugar? Double check. Make that double chin. These cookies are soft and tender, and yeah, they melt in your mouth. I whipped these up one Saturday afternoon, and then happily found myself packaging them up as a hostess gift. Hooray for new friends! Have you noticed when people say ‘these cookies would be great for tea time?’ I don’t know about your schedules, but I haven’t had time for tea since I was 5. And even then, it was tea made of air that my parents pretended to pour. So, I will tell you that these cookies take 10 minutes to whip up, 1 hour to chill, and then 15 minutes or so to bake. Fit that into your schedule and you’ll be very happy. We’re heading to Texas this weekend to scope out wedding venues. Have a great week! 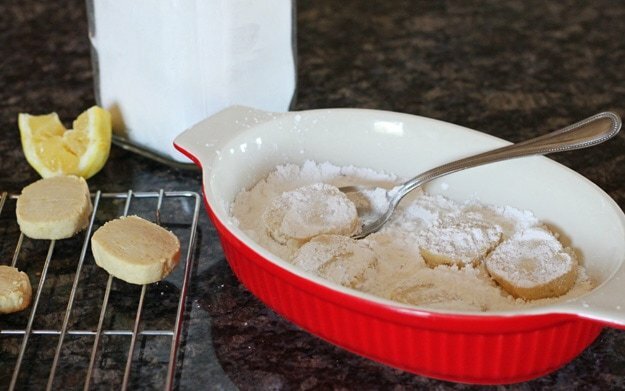 In a medium bowl, beat the butter and 2 tablespoons + 1 teaspoon of powdered sugar. Once well combined, add the lemon zest, juice and vanilla. Beat well. Next, sprinkle the flour, cornstarch and salt over the top. Beat the dry ingredients into the wet mixture carefully on low speed. The dough will be slightly crumbly. Next, dump the dough out onto a sheet of wax or parchment paper. Shape it into a uniform log about 6" long. Then, put the dough closest to the long end of the paper, then begin rolling it up in the paper, shaping the dough as you go. Your dough log will be roughly 8" long. 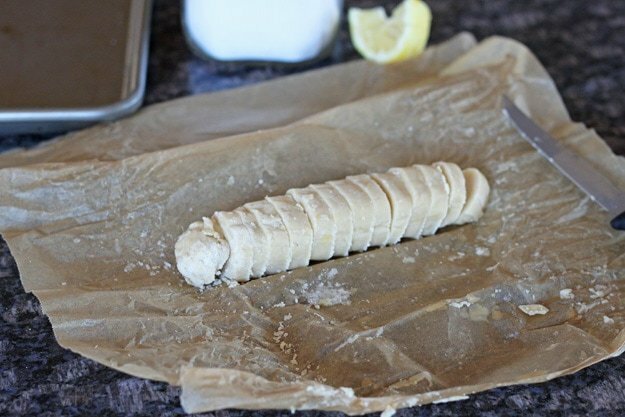 Twist the ends of the paper closed and refrigerate the dough log for 1 hour. After one hour has elapsed, preheat the oven to the 350. Unroll the dough, slice it into 12 even slices then place the cookies on a baking sheet. Bake for 12-14 minutes, or until the edges of the cookies barely begin to turn golden. You won't see much color change, so look closely. Remove the pan from the oven and let the cookies cool on the sheet for 5 minutes. Meanwhile, have ready a shallow bowl with the extra powdered sugar for rolling. Roll each cookie in powdered sugar while still warm, and let the cookies cool before serving. Good God Almighty, I LOVE meltaway cookies and I’m eternally grateful for this recipe. And the fact that it’s a small batch. Oink. Mmm these sound so fabulous! Yum! These are my next project! I love anything lemon – the melt part is a bonus ha ha! And they are so quick (besides the chilling time – which is no effort) to make – good week night bake! Woohoo! Good luck with your wedding venue search – you have wonderful taste, i am sure youwill find a beautiful spot! These are almost too easy! Delish. I have been craving lemon lately – I think it is a summertime thing. These look easy and tasty. I can’t wait to try out the recipe! And good luck finding a venu! Have you picked a date?? Double Chin! haha, you’re the best! Meltaways are one of my most favorite cookies! Love citrusy cookies and these sound just perfect. Cookies that melt in your mouth are never a bad thing. Safe travels my friend! Mmm. . .cookies that melt in your mouth. . .and are easy to make!! best name for a cookie ever! lemon desserts are only just about my favorite thing on this planet…bring on the double chin! Hooray for wedding venues!! Good luck, hope you find something amazing! mmmm I just melted reading about these! can’t wait to make them this summer! YUM! I love lemon desserts. And cookies. And lemon cookies. You get the idea. These cookies look amazing! Yum! And how exciting to be looking for wedding venues! :) That was one of the best parts of planning ours. We got married at a winery (highly suggest btw) so what else are you to do except taste the wine??? ;) Good luck looking for one! Like you, I’m a big fan of shortbread-style cookies. I’ve never heard of meltaways, which is ridiculous because I’m a big cookie lover. Looks awesome! I love anything with lemon! Good luck wedding venue hunting! They sound wonderful and what a bonus that they are so easy to mix up and bake. Have fun in Texas scouting out a venue for the wedding. Yum! I love anything lemon! I, just like you, love cookies rolled in sugar! Good luck wedding venue shopping! I missed you! These look yummy, love lemon! Good luck on Texas, it’s such an exciting time to plan a wedding. Yum, these look divine! Perfect summer treat! These look delicious. Thanks for the recipe. double chi, love it!! have fun in Texas!! 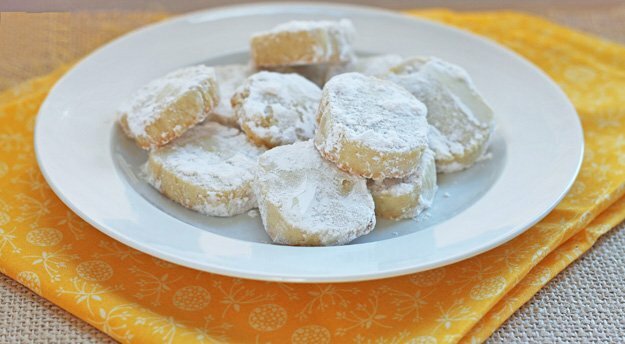 Love lemon meltaways, and these look just perfect! I am a huge fan of lemon cookies, so I will definitely be making these!!! I want melt in your mouth cookies, yum! Melty cookies with lemon?! Yes please! looks wonderful! :D i love lemon flavored anything! Pingback: Lemon Cookie for Mom | The Gab Lab! Made these and they were easy to make and soft and tasty thanks for the recipe! I really love this recipe! I made these for the first time a month ago but it wasn’t enough! I ended up tripling the recipe this time but they are so delicious that they were gone in a flash (I made them last night and we have 5 left!) A recipe I will highly recommend to every one!! can these cookies be rolled and cut into many shapes using a cookie cutter, plus if they are rolled by a rolling pin will they still melt in your mouth? or will they be hard? I didn’t test the recipe that way. I have no idea, I’m sorry. If you try it, let me know. These are perfect for my friend who can’t eat eggs!! It’s now my new fav recipe!!! Wanted to comment because I just made these this weekend and they came out really salty! I think if I made them again I would increase the confectioner’s sugar in the first step.